Taking a firm stand against the proposed bandh by the Sri Lankan Tamils’ Protection Forum on February 4, the Tamil Nadu government today termed it as “illegal” and warned that it would take stringent action to maintain law and order on that day. Thousands of youths, carrying LTTE flags and portraits of Tiger chief Velupillai Prabhakaran, marched through city roads during the nine-hour-long funeral procession of Muthukumar, who immolated himself condemning the Centre’s support to Sri Lanka’s military offensive. Terrorism is taking root in Tamil Nadu as extremist organisations are exploiting the prevailing situation in the state, Tamil Nadu Congress Committee president K V Thangabalu has warned. The abject failure of the India-Pakistan joint anti-terror mechanism notwithstanding, New Delhi is looking positively at Dhaka’s proposal to form an Indo-Bangladesh counter terror mechanism to combat the menace. A group of armed Naxals today killed 15 policemen, including a young police sub-inspector, in an encounter in Markegaon in Gadchiroli district here, police said. The government is all set to amend the Emigration Rules, 1983 to make the eligibility criteria for recruitment agencies more stringent. Caste is proving to be stronger than political affiliations in Maharashtra as politicians, cutting across party lines, are taking call on the demand by the powerful Maratha community for reservations in jobs. At 4.8 per cent of the GDP, India’s total annual health expenditure (THE) is among the poorest in the world, with only Nigeria, Indonesia and Bangladesh reporting lesser expenditure. The WHO recommends a total annual health expenditure of 6.5 per cent of a country’s GDP. Railway Minister Lalu Prasad is against appointment of retired bureaucrats on key posts. Reacting to the latest controversy in the Election Commission, the RJD chief categorically said no retired bureaucrat should be appointed either as a member or chairman of any commission. An Airbus 320 of low-cost air carrier Indigo with around 163 passengers on board a flight from Goa to Delhi made an emergency landing at the IGI airport here after a mid-air scare when a “couple” of unruly passengers threatened to “hijack” the aeroplane. Fake pharmaceutical product-making racket is an old phenomenon but the police in Bangalore has unearthed something that has something novel about it. They have unearthed a shop making fake ayurvedic medicines. Officials of the Federal Bureau of Investigation (FBI) have made a request to interrogate the two militants arrested earlier by the Uttar Pradesh police and questioned by the Mumbai police in connection with the 26/11 terror strikes. The investigations into the alleged drug racket of IPS officer Saji Mohan, arrested by the Mumbai ATS with 12 kg of heroin, has broadened with more names including that of a mediaperson, coming under the scanner. The popular hill shrine at Tirumala in Andhra Pradesh will soon acquire a glittering look, similar to the famous Golden Temple of Amritsar. The Supreme Court has held that a district collector is not a judge and as such cannot seek immunity from prosecution in criminal cases. As many as 13 persons, including two women and a minor girl, were killed and three others injured when a truck in which they were travelling turned turtle and fell into a narrow gorge on the Delhi-Lucknow road, near 25 km from here, today. A CPM leader was shot dead today by suspected Maoists at Lalgarh in West Midnapore district. A 22-year-old youth jumped from a 160-metre high cellphone tower at Cuddalore today, urging the Centre to stop its support to the Sri Lankan government’s military offensive. The man Needhivanan, alias Dheenadayalan, belonging to Alapakkam village, climbed the cellphone tower and jumped down, carrying pamphlets demanding immediate ceasefire in the island nation. His bones in legs, hands and hips were fractured. He had been admitted to the Cuddalore government hospital. The Supreme Court had categorically stated that the bandh should not be observed in any part of the country, by any organisation, an official release here said. Recalling that the bandh on the Sethusamudram canal issue was later changed into a hunger strike following the direction of the Supreme Court against it, the government said the case was still pending in the Supreme Court. The government also noted that the petition against the bandh on the Sethusamudram issue was filed by AIADMK supremo J Jayalalithaa. Since the bandh was against the Supreme Court order, the state government would take all action to maintain law and order and precautionary steps would be taken to ensure free movement of traffic and supply of all commodities to the people, it said. The government also issued directions postponing examinations in all universities, since all engineering, medical, law and arts colleges and schools throughout the state had been closed due to the unrest among students on the Sri Lankan Tamils’ issue. The STPF, comprising MDMK, PMK, VCK, CPI and other pro-Tamil organisations, have called for the bandh, demanding stopping of military support by the Centre to the Sri Lankan government and urging an immediate ceasefire. There is no response from the DMK headquarters for the proposed bandh. The party is expected to come out with its strategy at its executive committee meeting on February 3, to counter the criticism of opposition parties, especially the MDMK and CPI. The procession, which began around 3 pm yesterday, ended at midnight and a condolence meeting concluded early morning today. The body of Muthukumar was covered with the flag of the LTTE and a van carrying his body was adorned with Tiger flags and portraits of Prabhakaran. Even a conservative estimate of the participants would put the figure at 30,000. A majority of them were students of law, medical and arts colleges, who had come from different parts of the state. After the funeral procession of former Chief Minister and matinee idol MGR two decades ago, the city has not witnessed such a huge funeral procession. The students shouted slogans against the Centre and hailed the LTTE and its leader. However, no one carried the flag of any political party. Cadres of the MDMK and the VCK were seen carrying black flags. All shops and business establishments in the procession route were shut down as a mark of respect for Muthukumar. Effigies of AICC president Sonia Gandhi and Sri Lankan President Mahinda Rajapaksa were burnt at several places during the procession and portraits, banners and posters of Congress leader found in the way were damaged. Flags of the Congress were burnt at several places. Effigies of AIADMK supremo J Jayalalithaa were burnt by some protesters, who shouted slogans condemning the anti-Tiger remarks of the AIADMK leader, a day before Muthukumar’s death. Earlier, people laid wreaths on the body of Muthukumar. Angry students pelted DMK workers with stones when they came to pay homage to the youth. No one from the DMK turned out after that incident. Muthukumar’s family also rejected the Rs 2 lakh solatium announced by the state government. However, P Nedumaran, co-ordinator of the Sri Lankan Tamils Protection Forum, announced that the forum would provide Rs 3 lakh to the poor family. Some political parties and extremist organisations, under the pretext of supporting “suffering Tamils” in Sri Lanka, are indulging in violent activities, including burning of portraits of Congress president Sonia Gandhi and PM Manmohan Singh and destroying party flag poles, he said. Apart from preventing such activities, the state government should detain the miscreants under the National Security Act, the Congress leader demanded. The DMK government should also take action against supporters of the banned LTTE, he added. The contours of such a mechanism are likely to be discussed at length when External Affairs Minister Prabab Mukherjee visits Dhaka on February 9, in what will be the first high-level interaction between the two countries after the installation of the Sheikh Hasina government. The speculation was rife that Mukherjee might postpone his visit since he is now presiding over the government in view of Prime Minister Manmohan Singh’s ill health. He would be involved in the budgetary exercise as he is also holding the additional charge of the Finance Ministry. However, it has been decided that Mukherjee must go ahead with the visit to Dhaka, reflecting the importance New Delhi attachés to strengthening ties with the Awami League government that is considered a ‘friendly’ dispensation in diplomatic circles here. However, Mukherjee is likely to mince no words in expressing to Bangladeshi India’s concern over the activities of Islamic fundamentalist groups being aided and abetted by Pakistan’s ISI. The Naxalites after killing the policemen fled with eight AK 47, two Insa self loading rifles, four self loading rifles, one pistol and two inch mortar, they said. Police have recovered all the bodies of slain policemen that are being brought back to district headquarters by late tonight. The Naxalites were hiding in the deep forest waiting for police patrol party to launch an attack on them, police said. They opened indiscriminate firing on patrolling party, killing all of them including young PSI Upendra Gudhedkar on the spot, they said. Other policemen who fell in the line of duty are Baishak Padodi, Subhash Bhogre, Suresh Naitam, Madhav Pote, Bhagu Koram, Chous Amar Wadatkar, Duryodhar Halame, police havildar Kalidam Halame, Rohidas Kumre, Nanu Tubari, Rupesh Poindre, Dilip Bhuke, Manish Kalyan Palliwar and Sudhakar Ukarpate. Initial reports said that there was no information of any other injured policemen. Similarly, there was no report of Naxals being injured or killed in the counter attack. A police team on learning about the incident immediately rushed to the site and recovered all the bodies. Homage will be paid to these personnel tomorrow at District Police Headquarters before the bodies are handed over to their relatives. The police are not taking any chance while removing bodies of policemen since naxals have laid land mines all along the routes, police added. Official sources said the Overseas Indian Affairs Ministry and the Law Ministry were finalising the amendments to be introduced in the rules, which would possibly be notified shortly. The proposed changes seek to introduce educational criteria (graduation or two-year diploma) and enhance the financial soundness criteria for the recruitment agents. It was also proposed to dispense with the requirement of affidavits sworn in before the judicial magistrate and also do away with the requirement of police verification. The sources said the proposed measures seek to enhance the amounts of bank guarantee, the registration fee and the service charges required from the agents. The emigration rules would be changed to specify the duties of the recruiting agents, and the facilities to be maintained by them. The move is intended to help revamp the recruitment system and better protect the emigrant workers. The government was also working on introducing a rating system for the recruitment agents to enable the market to encourage good practices in the recruitment industry and eliminate the wrongdoers. The rating system would be based on well-defined performance parameters relating to quality of service and statutory compliance. The Marathas, who amount to more than 35 pc of the state’s population, are holding rallies and public meetings across the state in pursuit of their demand. Leaders of the community are egged on by the ruling Congress and the Nationalist Congress Party which have traditionally held on to the support of the Marathas. “Marathas should be given the benefit of reservations since majority of us are economically backward. We should be classified as a backward caste,” said NCP leader Vinayak Mete, who has formed an organisation -- Maratha Aarakshan Samanwaya Samiti--- to fight the cause of the community. Mete seems to have patterned his methods on the lines of the Gujjar agitation last year demanding reservations. Former Chief Minister Vilasrao Deshmukh virtually fuelled the demand of the Marathas by agreeing to classify the community as a backward caste and make its members eligible for reservations. His fellow Maratha, incumbent CM Ashok Chavan, has promised to bring in a resolution in the state Assembly to assuage members of the community. 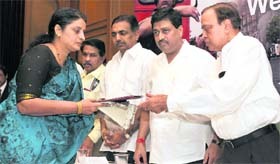 “The state government is not opposed to quotas for poor Marathas,” Chavan said. However, the proposal has angered the Dalits and other backward caste leaders who are mobilising on caste lines. Leading them are NCP leader Chhagan Bhujbal and Gopinath Munde of the BJP. Both leaders, who are from the backward castes, have warned against any attempt to reduce the slice of the deprived classes in government reservations. The two leaders have now joined hands with Chandrakant Handore of the Congress to create a platform to prevent the Marathas from sharing their cake. But the Indian situation is particularly grim, as the latest report of the Independent Commission on Development and Health in India points out. The public health expenditure (PHE) in the country is as low as Rs 215 per capita per year. It works out to a shockingly low 1.2 per cent of the GDP and 25 per cent of the total health expenditure. “The figure compares unfavourbly with an average public sector health expenditure of 2.8 per cent of the GDP recorded for the low and middle-income countries, and 1.7 per cent for even the impoverished sub-Saharan African countries; the global average of PHE is 5.5 per cent of the GDP,” the report states. That the basic health services are yet to reach the low-income groups is clear from the fact that a whopping 75 per cent funding of the health sector still comes from private sources. The private health funding makes up 82 per cent of the out-patient care in India and 55 per cent of the in-patient care. It is further estimated that the private sector has 85 pc of the graduate doctors in the country; 58 pc of the total hospitals and 29 per cent of the beds in hospitals. Another significant fact is that most of the services provided in the private sector are through untrained practitioners or practitioners in the Indian system of medicine, who indulge in cross-practice harming patient interests. The increasing private funding of health is a poor indicator. A range of health economics studies have found private out-patient services to be 20 to 54 per cent higher and private in-patient services to be 107 to 840 per cent higher. The national Samples Survey Organisation’s 60th round has reported 126 per cent increase in urban hospitalisation costs and 78 per cent increase in rural hospitalisation costs in the private sector as compared to the 52nd NSSO conducted in 1995. Making a specific reference to information commission, he said right to information was being misused by vested interests. He added that crores of rupees being spent on its implementation was an exercise in futility. “People were asking absurd questions,” said the RJD chief, while talking to mediapersons here today. Lalu’s strong criticism of RTI is likely to invite the ire of information activists across the country who are sincerely working for its implementation in each and every department of the government. Lalu also announced opening of a divisonal headquarter of the railways at Thawe in Gopalganj district and Bhagalpur. He is likely to include these projects in the coming railway budget which would be his last budget before the Lok Sabha polls. Lalu’s ancestral village — Phulwaria — and his wife Rabri Devi’s parental village Selar Kala were brought on the railway map recently. All passengers and the six-member crew of Flight 6E 334 were safe and the situation is under control, airport officials said tonight. Civil Aviation Secretary M Madhavan Namibar told mediapersons that passengers, who made the threat, were being questioned by the authorities amid reports that one of them may be in an inebriated condition. The identity of the passengers was not immediately known. 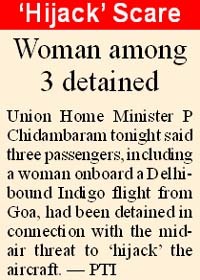 Unconfirmed reports said three passengers were being questioned while Indigo CEO Aditya Ghosh said more than one passenger created a ruckus. As the over two-hour drama unfolded after the aeroplane pilot reported to the Air Traffic Control here that a “couple” of passengers were behaving aggressively and made a hijack threat, emergency drill was in place and the aircraft was taken to the isolation bay at the airport. The threat was made about 15 minutes before the aircraft was due to land. Fake pharmaceutical product-making racket is an old phenomenon but the police in Bangalore has unearthed something that has something novel about it. They have unearthed a shop making fake ayurvedic medicines. The owner of the shop and an employee have been booked in this connection. With various “alternative medicines” becoming increasingly popular, Swamy, owner of Tulasi Ayurvedic Bhandar in R K Puram area of Bangalore, saw opportunities in faking expensive Ayurvedic medicines. He started selling fake “Heerak Bhasma” and “Suvarna Bhasma” to customers. One gram of “Heerak Bhasma” (diamond ash) is sold for Rs 5,500 in the market while Suvarna Bhasma or gold ash is sold for Rs 4,000 for each gram. The practitioners of ayurveda believe that Heerak Bhasma can be used even for treating cancer. It is also considered good for immunity disorders and arthritis. Suvarna Bhasma, it is said, improves immunity and is also useful for treating weakness and anemia. Tulasi also faked other ayurvedic medicines like ashwaganda, jeharmora, moti powder, naguladora, gudamora and jestamada. The fake medicines started taking its toll on customers. Instead of getting cured, people started developing fresh problems after taking these medicines. The police were alerted and they started keeping a watch on the shop. They raided it after becoming certain that there was something fishy about the shop’s products. The raiding team caught Ramesh Basappa, an employee, in the act of mixing different seeds, roots, leaves and other material for preparing fake medicines. He spent money ranging from Rs 100 to Rs 1,500 for preparing fake medicines and sold them for very high prices. The FBI made the request through the proper channel for questioning Fahim Arshad Ansari and Sabbauddin, who were brought to Mumbai in December last year as a follow-up to the probe into the 26/11 attacks, official sources said. The role of a mediaperson closely associated with Mohan, besides possible involvement of more than one local Narcotics Control Bureau (NCB) official and others, was being looked into, official sources said. The NCB had even taken two of its men, posted in the Chandigarh zone, for questioning to Mumbai, from where Mohan, the former zonal director of the NCB (Chandigarh zone that includes Punjab and Himachal Pradesh), was arrested on January 24. Sources said involvement of more NCB officials was also being looked into as “a person alone cannot pull off such a racket”. It is learnt that the NCB would shortly approach a court to seek permission to break open sealed packets of narcotics seized to check if they have been swapped with any other material. The authorities at the country’s richest temple have decided to provide gold coating to the entire ‘Vaikunta Prakaram’ encircling the main sanctum sanctorum of the abode of Lord Venkateswara. The ambitious project is estimated to cost a whopping Rs 1,000 crore as nearly 100 tonne of pure gold is required for the purpose. “We will take the financial support of donors from all over the country and abroad to implement this mega plan,” said DK Adikesavulu Naidu, chairman of Tirumala Tirupati Devasthanams (TTD) — an autonomous body that manages the temple affairs. Utmost care will be taken to preserve the rare lithographic treasure available on the walls of the ‘Prakaram’ of the 12th century Vaishnavite shrine, he said. “The entire area of ‘Ananda Nilayam’ (covering the sanctum sanctorum) will be converted into golden temple. The works will commence after the approval from Agama advisers,” Naidu said. Tirumala, nestled among the picturesque string of seven hills, is the richest temple in India with its annual revenues crossing Rs 800 crore. The shrine attracts, on an average, 50,000 pilgrims every day and the number crosses one-lakh mark during festivals and special occasions. Meanwhile, as part of efforts to reach out to wider sections of the society, the TTD has decided to allow non-Brahmin students to learn Vedas in the Sri Venkateswara Vedapatasala being run by it. The TTD would deposit Rs one lakh in the name of each student at the time of admission. The amount will be given to the student while leaving the school after completion of the course. A bench of Justices RV Raveendran and JM Panchal ruled that the immunity granted to judges under Section 77 of the IPC would not be available to district collectors or the land acquisition officers who acquire private lands and award compensation. “The collector is neither a judge as defined under Section 19 nor does he act judicially, when discharging any of the functions under the Land Acquisition Act. 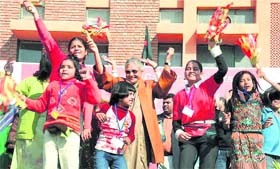 Therefore, he is not entitled to protection under Section 77 of the IPC,” the apex court observed. The apex court passed the ruling while setting aside a Rajasthan High Court order wherein the latter had quashed the FIR registered against the Jaipur district collector in a land acquisition case. The FIR alleges that the collector while acquiring certain private lands had grabbed lands belonging to the Rajasthan Housing Board in collusion with some having vested interest. The incident happened when the truck carrying iron beams was hit by another truck. “Thirteen persons, mostly labourers and the driver of the truck, were killed,” police spokesman Dinesh Sharma said, adding that the injured have been admitted to hospital here. Nandalal Pal, 32, zonal committee member of CPM, was returning home at noon after performing his mother's last rites, when he was shot dead by four persons at Murara village, official sources said.